Did some good afternoon riding with John (here’s his recap) and Mike on Saturday and ended up logging just over a metric half century. 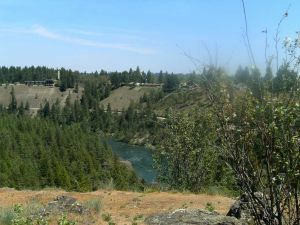 We met up downtown at Two Wheel Transit, zipped down the Riverside hill and then did a little trail riding (with occasional cliff side walking) off Government Way before getting onto the Centennial Trail. John knows all the cool little side trails through Riverside State Park so we did quite a bit of off road riding despite the fact that none of us were riding mountain bikes. 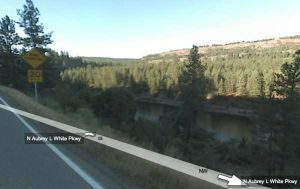 We crossed over the Spokane River at the 7 mile bridge and headed back on the Aubrey L White parkway. This was new territory for me, although coincidentally I was actually looking at it on Google Maps earlier this week as a way to get to Highway 251. It’s a nice scenic and low traffic route back towards Downtown Spokane and I’m sure I’ll ride it a few more times before the summer is over. My riding compatriots dusted me on the descent down to Doomsday Hill so there was no catching up to them until we regrouped at the parking lot at the top of the hill. From there we weaved our way through some neighborhoods over to the Maple Street bridge. The southbound lanes are currently closed to cars, but the first layer of pavement is down so it’s a smooth ride for bikes. It was pretty cool to have our half of the bridge all to ourselves as we crossed the river three abreast. John snapped a few pictures with his phone as we were riding and they turned out pretty good (see his recap). We parted ways with Mike around First and then John and I continued up the hill towards his house. Shortly after getting onto Adams John spotted a bike hauling another bike and took off in hot pursuit. It turned out to be a couple hauling one of their bikes home from the shop on an xtracycle. That was the first xtracycle conversion I’ve seen first hand and it looked pretty cool. We chatted briefly about some upcoming FBC events and then headed up Jefferson to John’s house. Once we got up there John and I hung out in the shade of his backyard for a while and shared some banana and peanut butter. I got a quick glimpse of John’s extensive bike collection when he showed me the recumbent he’s borrowed from a friend. The recumbent sounds fun to ride, but definitely different. I think he’s going to write about recumbent bikes in his Out There Monthly column at some point down the road. Right around 4PM it was time for me to head home so I hopped on my bike to put the last couple kms on my ride total. I stopped at Egger’s Meats to pick up some hamburger buns for the evening’s barbecue and rolled home with a paper bag full of buns and hot dogs. I really like shopping at Egger’s via my bike because they’re less than one km from my house. They don’t have a bike rack, but I can still lean my bike against one of their windows and keep an eye it for the short time I’m in the shop. Saturday’s ride total ended up being just over a metric half century at 53 km. Overall I felt strong the whole day, but I rode fairly conservatively and my legs didn’t have much pep by the time I got home. My total for this week was actually 192 km- a good 22 km more than I rode in the entire month of May last year when I was starting out. While I’m not where I was at the end of last Fall weight and fitness-wise, I’m really happy with the way I’m starting off this summer. Is Cycling 100 Km Hard?